In brief: We know that free-to-play games and battle royale titles generate a lot of cash, but is that amount decreasing? No, quite the opposite. A new report reveals that industry leader Fortnite earned $2.4 billion last year, “the most annual revenue of any game in history.” Fellow BR title PUBG did pretty well, too, amassing over $1 billion in digital revenue. 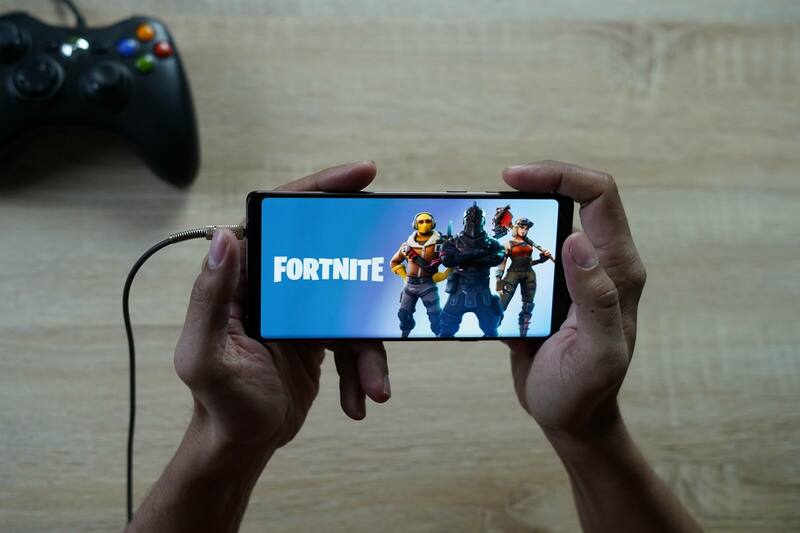 SuperData’s annual year in review notes that Fortnite’s influence helped push digital games revenue up 11 percent across mobile, PC, and console last year, reaching a total of $109.8 billion. The mobile platform led the way, bringing in $61.3 billion, followed by the PC’s contribution of $35.7 billion and console’s $12.7 billion. Free-to-play console games also got a massive boost in 2018, with revenue jumping 458 percent to $88 billion. That figure represents 80 percent of all digital games revenue. 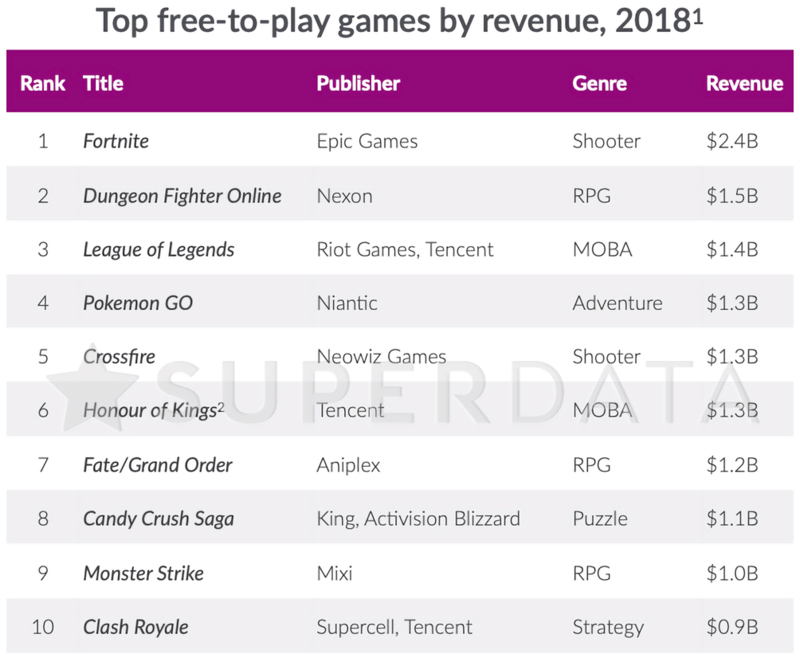 Sitting behind Fortnite on the highest earning FtP list is Dungeon Fighter Online ($1.5 billion), League of Legends ($1.4 billion), and Pokemon Go ($1.3 billion). 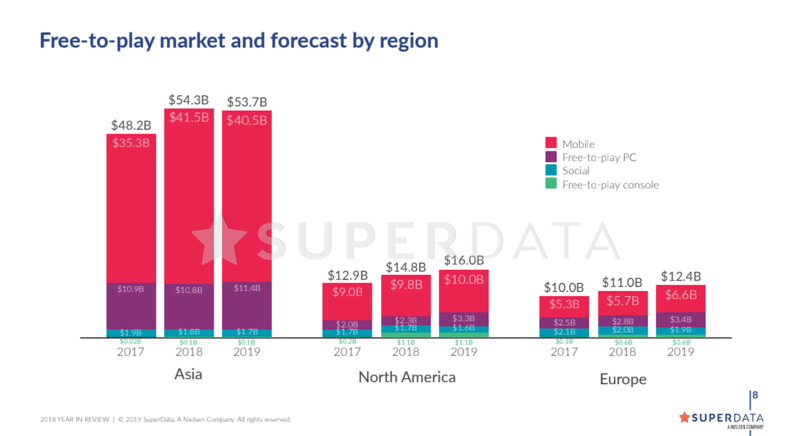 While it can’t match free-to-play, digital premium games’ revenue was also up last year, rising 10 percent to $17.8 billion. Despite living in the shadow of Fortnite, which Netflix just called a big competitor, PUBG was the top earner here, making 19 percent more than it did during 2017. PUBG beat the likes of GTA V and Red Dead Redemption 2 by generating $1.028 billion—a number that doesn’t include money from the mobile version, which would have pushed its total earnings even higher. Check out the full top ten list below.